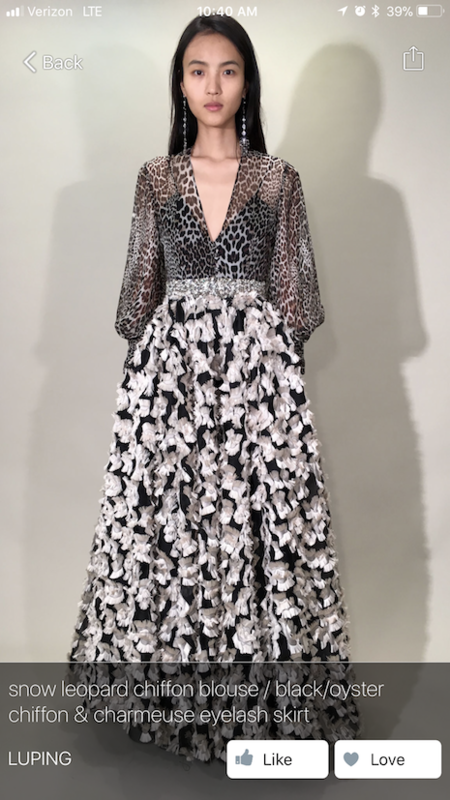 U.S. fashion label Badgley Mischka has opened a pathway to discovering the most beloved items of its collection the moment they hit the runway. 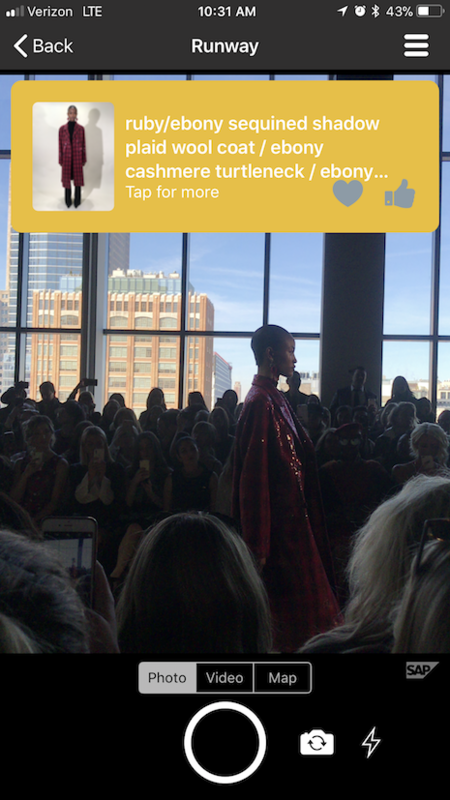 The brand took a hands-on approach to its fall/winter 2018 show, gathering real-time data from audience members via a mobile application. Attendees were able to learn more about their favorite pieces and let Badgley Mischka know which were the most liked and loved in real time. 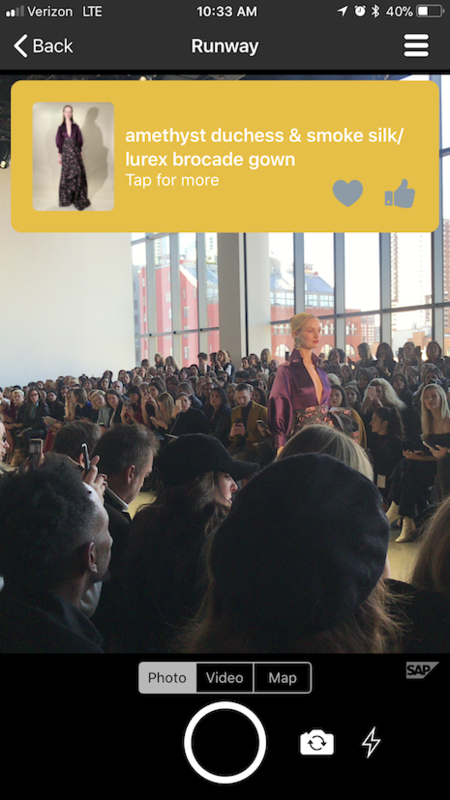 During New York Fashion Week, the brand launched an app built by tech sponsor SAP. Attendees of its show were able to use the app to select which pieces of the new collection they liked and loved. The experience mirrored many social media platforms, making it simple for users to manage. Models were fitted with beacons, which the brand’s app picked up as each woman entered the runway. Through the cameras on users’ phones, participants tapped on a model if they were interested in the piece she was wearing. The item’s information would appear, along with a photo and a short video clip introducing the product. Badgley Mischka's app leverages real time data. Attendees then selected the like or love button to show their appreciation for the piece. Backstage, the fashion label was able to get a clear view of what the most popular pieces of the show were as the presentation was happening. After the show, the label now has access to a bevy of data to help guide the direction of the collection. Data points such as what pieces were the most popular, where users were sitting and more will help give a clear picture of what was happening in attendees’ minds. Badgley Mischka will now be able to make better decisions regarding what pieces to put into production first, based on what was the most popular. Badgley Mischka app uses beacons for product information. The app is also beneficial to users outside of the show, with a “see the collection” option. This tab features all pieces from the show and allows users to like, love or learn more information about them. Badgley Mischka's app can be accessed outside of the show. With digital becoming such a prominent part of today’s culture, it is no surprise that fashion is adopting it as its own. Many brands are working digital into not only their stores and overall strategy, but into their runaway showsas well, similarly to Badgley Mischka. For instance, U.S. fashion label Michael Kors shared its fall 2017 runway presentation far and wide by livestreaming the New York Fashion Week show across a range of social platforms. For its Feb. 15 runway show held at Spring Studios, Michael Kors livestreamed the event on its Web site as well YouTube Live, Facebook Live and Twitter, a first for a fashion brand. In December 2016, Twitter introduced the ability to record live video in an immersive 360-degree format on its streaming application, Periscope (see story). 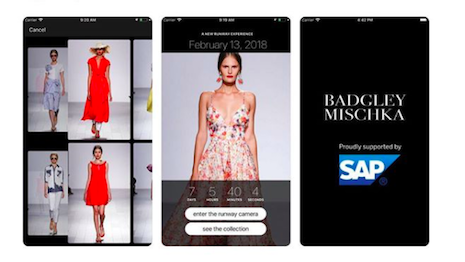 In another digital effort more like Badgley Mischka's, Launchmetrics gave brands additional opportunities to connect with influential individuals in the industry through its GPS Radar platforms. Originally launched in 2006, the site and companion app act as a centralized resource for the runway shows, giving members the ability to track and request invitations as well as find more information about a particular label’s runway looks. Along with other additions, an updated version of the app includes the addition of brand profiles, allowing companies themselves to share that latest with interested influencers and media (see more). Looking to raise the social media attention for its runway show during Paris Haute Couture week, fashion label Ralph & Russo cast an influencer in its model lineup. Brazilian blogger Camila Coelho closed the spring/summer 2018 show on Jan. 22 in the brand’s bridal gown. While many fashion labels have enlisted influencers for social media documentation of catwalks, this move by Ralph & Russo is indicative of the increasing roles these personalities are taking on via brand collaborations. For the London-based Ralph & Russo, digital is not just a marketing tactic but a part of business, as clients will place orders via social media as looks come down the runway (see more). “It was a little bit nerve wracking because you never know what is going to happen the first time you are using a technology,” Mr. Mischka said. “But there were no glitches and everyone was really excited to use it. “The models were crazy about it, because they were being fitted with the beacons,” he said. “They talked about 'this is the future,' which is great because they are the millennials.